The controversial Minister, who has been accused of wasting over a million dollars on a small wall around the Elmore Stoutt High School (ESHS) in the lead up to the 2015 General Elections while schools were left lacking basic supplies, said he was going to ask the Public Accounts Committee (PAC) to investigate certain spending under the then Minister for Education and Culture, Hon Fahie. The House of Assembly was at the time debating the motion for the appointment of a Chairman to the Higher Education Licensing Board. 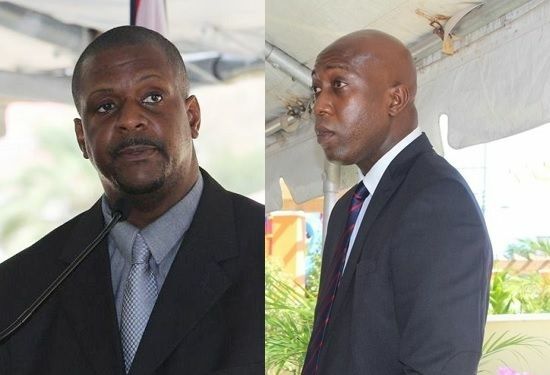 According to Hon Walwyn, who was challenged in the previous House of Assembly Sitting by Hon Fahie after he inappropriately attempted to defend BVI Airways, said the legislation now before the House came “without spending one penny” of the Government funds. Further, he said when he came into the Ministry of Education the matter of medical schools and other issues was on the table and he met with the Committee in place and was told that they had given their advice already. Further he said there was a reason his ministry did not go in the direction the current Minister is going. “But I know the nature of the Minister. He wants to make sure that Fahie look like he spend $500,000 and nothing." Told by the Speaker of the House, Hon Ingrid A. Moses, to wrap up the debate, Hon Walwyn continued that there was a company called Effect Inc that walked away with $602,355.88 of the public’s money. “For something that I did for free, for something that could have been done for free, and I want people to look into who Effect Inc is because there is more in the mortar besides the pistle. According to Hon Fahie he was not part of the tendering process. “There was a tendering process, Madam Speaker, competitive bidding, and there was a direction the Government was going…” Hon Fahie stated. At one point of the debate, Hon Walwyn, who was constantly urged to wrap up the debate but was bent on attacking the Opposition Leader, had Section 30 of the Standing Orders read to him as, according to Hon Moses, she did not take kindly to the Member suggesting that other persons in the House were not speaking the truth. Walwyn is a sick man. He is in for a rude awakening come next election. In fact the NDP Government is. I am baffled by the stupidity of this Government. War else is there to say. WAR else to say. That has always been WARWLN attitude: Drama, Divisiveness, and Conceitedness. @Lawd a merci. He is also a Big/Little Bully. Oh my. Why is that here in the BVI, just like in the U.S., governments just can't seem to stop the infighting and concentrate on issues of importance to the people they are supposed to represent? What a complete waist of time and energy this is. this minister will only open his mouth in the House of Assembly as he knows that his words are protected from liable within the walls. Please save NDP from themselves, especially your partner, warring wvm. Please counsel him and do what you can to save him from himself. Thank you in advance. Did anyone see Vino Cartoon? Keep up this war and see if we do not revert back to where we started from. It has been said. Fahie must be on to something with that wall why Myron now jumping. Myron is in his second consecutive 4yr term & only now since his government is failing he wants to create a diversion. Oh please. I want Fahie and that Company investigated! I have been asking for this for years! The poet, Riley wrote and I quote, 'When I see a bird that walks like a duck and swims like a duck and quacks like a duck, I call that bird a duck.' You can take Salem out of the country, but try as hard as you may, you can't take the country out of Salem. Respect has gone out of the House of Assembly, and just as in the case of the unfortunate murders in the Territory, this honorable house has now become the place where much character slaying takes place. So Fahie is all of a sudden Mr Clean? Walwyn looking attention Fahie. Please ignore him and continue to work for and with the people. It's a plot to rope you in their hot decisive corrupt disrespectful mess. Use your brain don't let this fake wicked boy get to you. Fahie has nothing to fear. And no weapon form against him shall prosper. Iz one ah dese ayo want to be leader of this country? At least we can see some kind of Wall..But people of the B weee I where is the Medical School?? Well I take my hat off to these NDP fellas with the ways they trying to be clever. Into his second term as minister of education and is now he making these claims, wow what a clever way to blow a smoke screen and try to divert the people's attention from the real issues at hand. Fahie, please do not be distracted. Don't mind the noise. These guys always coming with something to try and distract the people. Not clever enough Mr. Arrogant, wheel and come again, we will not be distracted. All this wont work if the government is corrupt. Clean your back yard first. Reading all these comments, it is clearer than ever: Walwyn is the boogey-man. This minister should not be a part of Virgin island politics in the first place. Who are his family ties as indigenous? The HOS has become a brawling ground. No more respect in the house. People from outside are listening. They want to know where we get two ministers from without Virgin island background in parentage. Set good examples for the youngsters. It is amusing (darkly, to be sure) to watch the national democratic party implode right before our eyes. Walwyn is interested in politics, not solutions. He's not going to take a loss like this without looking for an out that makes him look the best he can. MVW needs to learn that he can't bully in the HOA the way he could bully @ Marina Inn. They may have voted for him because of his "tough" talk. But that glow will be off soon. i have commented several times that one of the BVI's major problem in moving the country in the direction of prosperity to the benefit of everyone is the dirty little word "corruption"
MVW; not so much. Just a bully.